Ocean Beach Surf & Skate Shop San Diego, Core San Diego Surf Shop. Surf lessons, surf camps, surf and SUP board rentals in San Diego, Mission Beach and Ocean Beach. Ocean Beach Surf & Skate Shop opened its doors in 1999 to provide Ocean Experience Surfing School with a retail store and home base. With San Diego and the Pacific Ocean as your classroom you need the most advanced technology in surfing equipment, Ocean Beach Surf & Skate provides just that. Recently voted “Best Surf Shop” in 2010, 2011, and 2012 and “Best Skate Shop” in 2016 & 2017 by San Diego’s City Beat Magazine’s Best Of and “gold-medal winner” of The Peninsula Beacon’s 2012 & 2016 Readers Choice Awards for “Best Skate Shop,” OBSS promotes the Southern California lifestyle while supplying core needs to surfers and skateboarders alike. Ocean Experience San Diego Surfing School and Ocean Beach Surf & Skate Shop take pride in providing positive and meaningful experiences to all clients, patrons and associates. 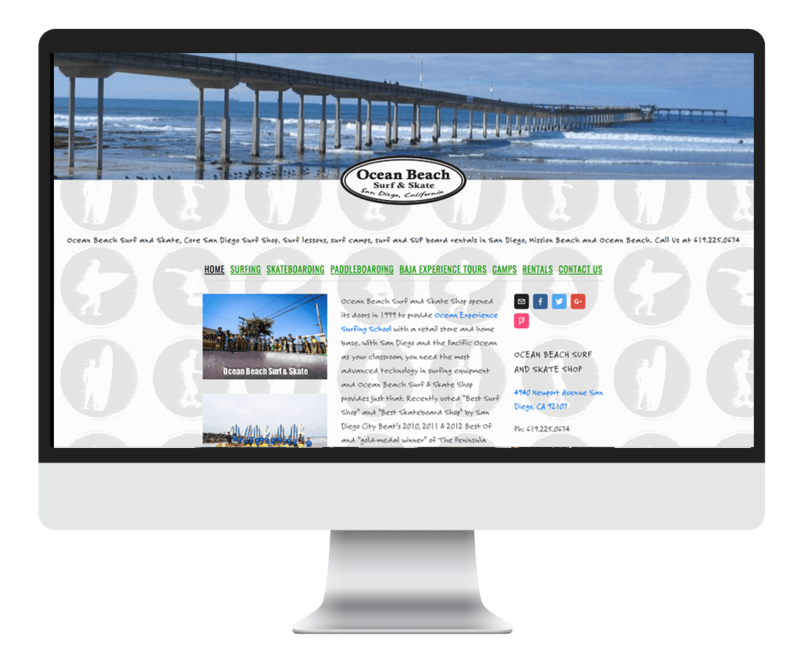 Ocean Beach Surf & Skate conducts all business with the highest standards of service, integrity and quality. We are a great place for the pre and post session hang-out. OBSS offers custom surfboards, skateboards, stand up paddleboards (SUP’s) wetsuits, sandals, boardshorts, bikinis, apparel and more. Many San Diego skateboarders know about the great selection of skateboarding equipment and accessories offered at Ocean Beach. So stop by, come in, look around and get the inside track on all the latest and greatest surfing and skateboarding supplies available in San Diego. Ocean Experience is one of San Diego’s oldest travel adventure companies, offering all-inclusive, eco-cultural adventure tours and guided service to secure locations throughout Baja, Mexico. Travelers enjoy adventures in surf, stand up paddleboard (SUP), kayak, and more. Clean, comfortable lodging and healthy, delicious meals welcome worldly travelers who come to experience Mexico’s warm culture and natural landscape. Book a private party or join a tour to breaks along the Pacific Coast. SUP/kayak/snorkel the Sea of Cortez, or enjoy mountain vineyards and desert hot springs. Great rates on all-inclusive adventures; group discounts.